What to know all about fleet vehicles, financing them and their care? Then you have come to the right place. Companies with a greater need for transport (such as employees that are expected to drive as part of their job frequently), could require a fleet. Here at Carleasingmadesimple.com, there are a wide variety of the latest fleet car reviews to aid you in your choice. Taxis, police cars, government fleets, and rental vehicles also fall under the category of fleet cars. Under Contract Hire, a vehicle of your choice is provided for a set time period in exchange for a fixed monthly fee. The monthly cost is determined using the total value of the fleet vehicle, the amount of months required to finance the cost, estimated mileage and the expected depreciation of the vehicle whilst it is under the finance agreement. At the end of the contract the vehicle is simply returned to, or collected by the provider. In addition to basic rental the vehicle user can opt to add-on other services such as maintenance and accident management. Fixed monthly cost – no inflation and therefore stability. Removes risks associated with vehicle ownership – depreciation, maintenance costs, etc. The contract suits the needs of the business – contract term, mileage. Looking for a used car? An option less considered by used car shoppers is that of a fleet vehicle. If you manage to cut out the middle man – auction houses, etc – you can find fleet vehicles for a competitive price. However, it must be remembered that acquiring the car on finance is unlikely as most are sold in exchange for a one-off payment. You may find exceptions to this rule at some rental car companies who will provide financing or accept a loan arranged with your bank. Be careful when considering purchasing a fleet car for your personal use as they are typically hard-driven vehicles with excessive mileage. You must be prepared to repair and maintain the vehicle and know what you are taking on. There are fleet servicing firms around the UK that deal with all areas of fleet servicing. They handle annual servicing, repairs, mid contract inspections and end of lease preparation for businesses. Regardless of your fleet size, packages can be altered to your company needs. 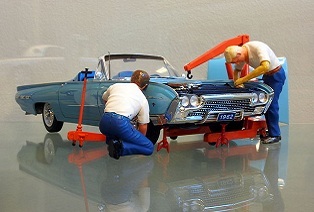 In fact, utilising fleet car servicing companies, can help keep your maintenance budget in check. Ensuring your vehicles are properly serviced and maintained can help reduce premature replacement of items that are subject to wear and tear such as brakes and tyres. It is worth mentioning that in 2003, ‘Block Exemption,’ a European legislation was introduced which enables these servicing firms to service your fleet without any invalidation of your manufacturer’s warranty.